I am working with a person to help him troubleshoot and get rid of his very troublesome health issues, which include fibromyalgia and chronic fatigue syndrome (CFS). Incidentally, this person has been on a "paleo diet" for several years, but this hasn't helped with his most troublesome health complaints. This isn't an argument against the diet, but is merely an example that eating plan vanilla paleo is a necessary but often not sufficient step towards complete health. Anyway, I wanted to share some tidbits from our investigation of his case. It should be quite interesting because we employed a range of tools (including 23andMe genetic testing) to home in on different problem areas. Exhibit A: 23andMe genetic test results analyzed through Promethease software. 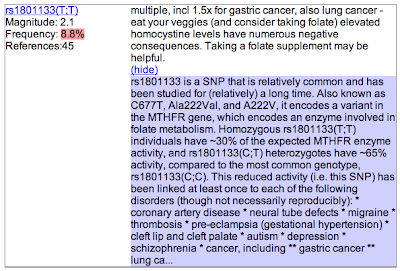 Here we found the genetic variant ("polymorphism") associated with problems with folate metabolism, and which is common in people with CFS and fibromyalgia and many other whacky health conditions. BINGO! Exhibit B: …However, a test of plasma homocysteine showed a perfectly normal reading (7.9 umol/L with 15 considered elevated), so no apparent sign of a problem here when using this common doctor's office test. The non-confirmation here shows one of the big limitations of genetic testing alone. Genetic testing just can't predict how genes are actually expressed in a person's body, and the body also has clever backup systems to prevent problems. Exhibit C: In order to dig further, we performed a test for urinary metabolic markers of methylation problems. BINGO! The high reading of "FIGLU" shows that the genetic propensity actually translates into a real problem, but this through a different pathway than the one that would result in elevated homocysteine. Through this finding we know with more certainty that proper function in the body may be supported through supplementation with a natural form of folate called 5-MTHF, and that the problem is both functional and genetic. Now proponents of evolutionary thinking may ask: "How can it be that some people with this genetic issue develop health problems when many others do not? And, why hasn't this common variant/mutation been weeded out of the gene pool?". This is an especially valid question since 5-MTHF is the natural form of folate that one could readily get from one's diet if one eats a proper human diet rich in items such as green leafy vegetables, egg yolks and liver. Exhibit D: A salivary panel looking at immune function in the mucosal barriers revealed that the immune system in the GI tract is likely to be very weak. The very low reading of 4.8 for Secretory IgA (a type of anti-body involved in the first line defense of the GI tract) indicates that chronic inflammation may have exhausted the immune system. This condition often correlates with poor absorption of nutrients because of destruction of the intestinal lining and problems with the gut flora. Exhibit E: A hair trace minerals analysis confirms this idea as many nutritional elements (notably iron) are found to be low. Notable here is also that cobalt is non existent(!). 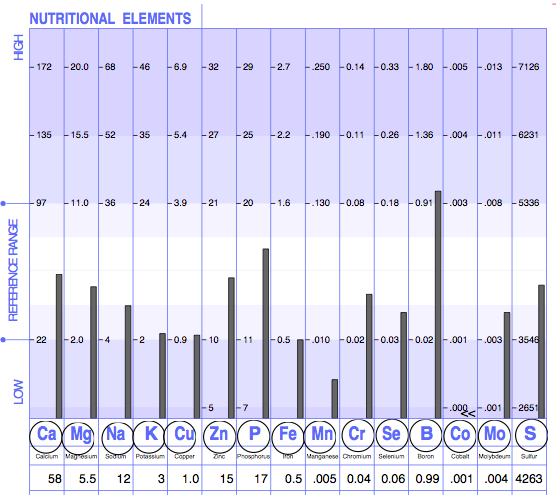 Cobalt is involved in folate metabolism (in ways that I don't yet understand), so this reading may be another confirmation of abnormality in this area, and something to ponder further. In summary, the findings revealed through this process indicate that my client likely would benefit from 5-MTHF supplementation, potentially for life. However, since we are also working on healing his gut and his absorption, it is not unlikely that supplementation ultimately becomes unnecessary. Genetics is not destiny. 1) Genetic testing is almost never the final word on any actual or potential health issue, but may give clues about where to look for functional signs of problems. Forget the idea of deriving your diet or supplementation regimen from genetic tests. 3) Most of the diagnostic tools that I and my client used above will become very difficult/expensive/impossible to get access to unless YOU fight against government intrusions into health, food, and medicine. Same thing with advanced supplements such as 5-MTHF (and probably even Vitamin D) in effective doses. So stop voting for Fascist politicians who in the name of "food safety", "consumer protection", "universal coverage" or crying babies rob you of access to your means of staying healthy and to save your own life.